So now that we have some beautiful new yarns from Knit Collage in stock, we’ve been asking ourselves, what to make with all these fantastic yarns? Particularly looking for projects that only require one skein. So far this is our favorite, and I’m currently working on knitting it up. Its a quick pattern made in super bulky and sparkly Pixie Dust yarn which will keep you warm and toasty in any weather. It’s classified as an intermediate level pattern and knits to about 22 inches in circumference on size 17 Circular Needles. 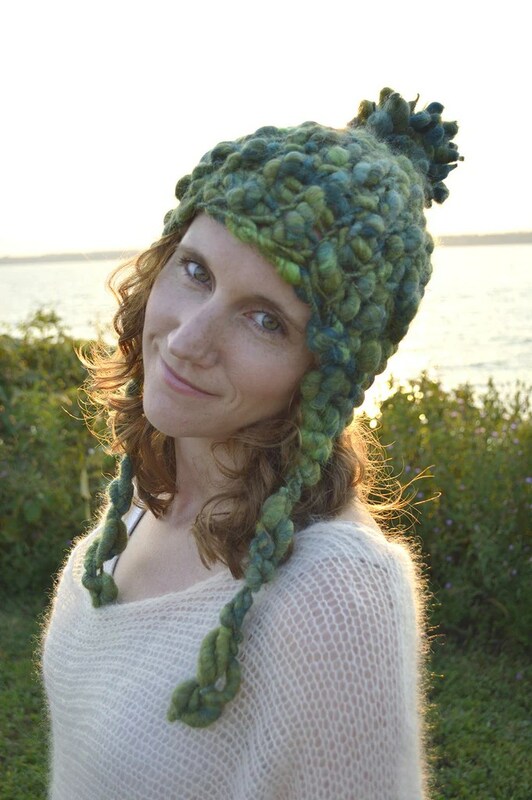 Designed by Danielle Shields this hat shows off the best aspects of this bumpy yarn. Get the yarn, pattern, plus Free Designer Additions (buttons and bobs) to add to your hat to make it uniquely yours, only when you buy from us! About the Yarn: Pixie Dust Yarn is a scrumptious mix of wool and mohair colors with tiny bursts of angelina sparkles all handspun together. This yarn is super bulky with a cocoon-like slubby texture that is both soft and fluffy. Pixie Dust is a perfect choice for accessories and home goods projects.Even though the raw materials are the same, no two skeins are completely alike because of the intense handmade process that goes into each and every skein. Gauge: about 1-1.5 stitches per inch. Suggested Needle Size: US 19 – 35 and 15.5mm – 19mm. Washing Instructions: Gently handwash and lay flat to dry. To check out our Pixie Dust colors in stock please visit our online store, when you buy your yarn from us, you can get the pattern and Designer Additions FREE! To see more of Knit Collage’s fantastic Patterns and Yarns visit us online!